Twitter allows users to send private messages, but the sender must be a follower by the recipient in order to get the message private, but can not complete this process. 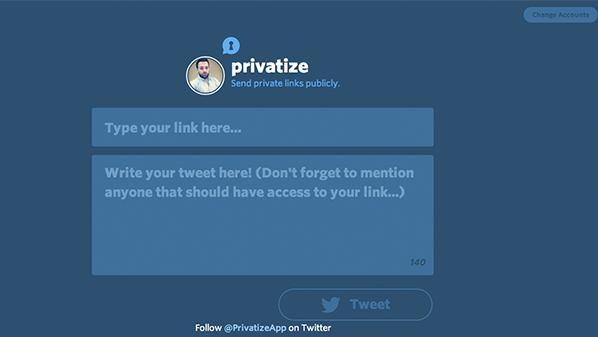 So Twitter users can save time and help from the location http://privatize.io which provides a tool for sending messages and specifically links without the need to enter into the intricacies of policy Twitter. Access to the site after the user needs to log on using their account, then writes the message with typing the name of the user who wants Barslha him with a link you would like to send it in secret. Finally, by clicking on the Tweet button is sending a message; show where all but the link can not be seen only by the addressee only.